As the U.S. Congress continues to stifle comprehensive immigration reform, we’re promoting questions to municipalities, governors and state agencies in how to pave the way for citizenship. We’re following the work of award-winning journalist Jose Antonio Vargas, who bravely outed his status as an undocumented immigrant in his terrific piece “My Life As an Undocumented Immigrant.” In the spirit of Vargas’ project for narrative-driven immigrant accounts, “Define American”, we’re hoping to crowd-source powerful immigration reform appeals on AskThem. 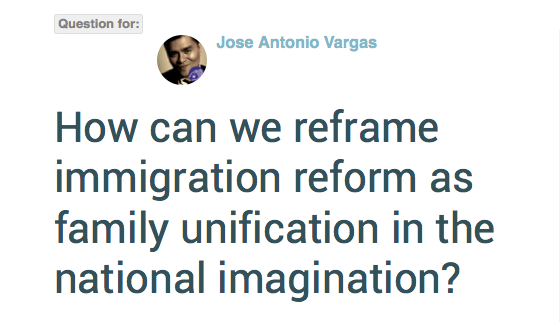 How does Jose Antonio Vargas narrate the long-standing impacts of familial separation? When will the Enlist Act make it to the floor for a vote? Will Governor Cuomo advance the Dream Act in the Senate? What impact will Municipal ID Card have on NYC immigrant communities? Questions & comments welcome: maryam at askthem.io, @AskThemPPF on Twttr & page on Facebook. Let us know what questions you ask public figures.